The Bradford Rattlers and GMHL have released the 2013/14 Regular Season schedule. Your Bradford Rattlers will open the season on the road against the expansion Halton Ravens on Thursday, September 5th. After which, Bradford will return home and open a three game home stand on Sunday, September 8th. 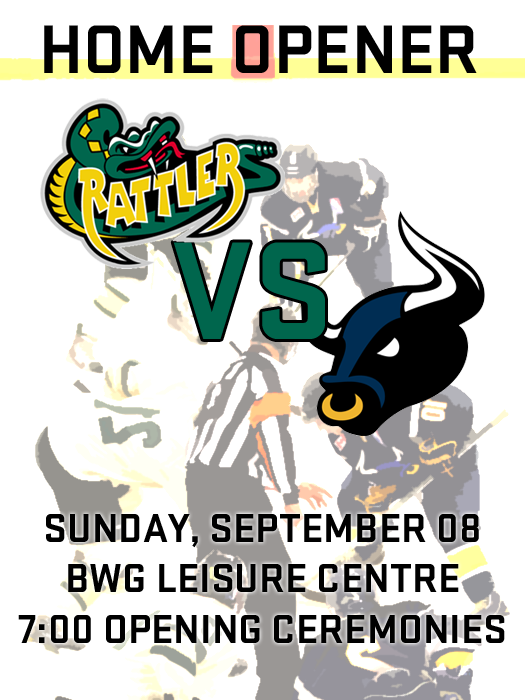 This year's home opener will be played against the Rattlers biggest rival from last season, the Bulls. Pre-game ceremonies will commence at 7:00PM. All home games this year will again be played out of the BWG Leisure Centre and broadcasted online over www.Livestream.com/BradfordRattlers. A notable date to prepare for is October 20th when the Temiscaming Titans come to Bradford. The Titans fell to the hands on the Rattlers in the Russell Cup finals last season and this will be the first time these two clubs have met since then. For those of you still keeping track, the Rattlers Regular Season win-streak is currently sitting at 46 wins. The entire organization is extremely excited to hit the ice. An entire new roster, Johan Lundskog returning behind the bench, NCAA programs and professional clubs already committed to attend Rattler games and so much more that will be announced shortly has us on the edge of our seat. As mentioned, the season can't come fast enough!